Today I am sharing a card that I made using the Follow Your Dreams bundle from Stampin' Up! I am participating in the great Crazy Crafters monthly highlights. The team is full of amazing and inspiring women from all over Australia. I have decided to use my favourite bundle from the annual catalogue featuring my favourite which is dream catchers. I absolutely adore this bundle and the gorgeous imagery. I combined a new colour combo for me which is Coastal Cabana and Gorgeous Grape with touches Gold and Blueberry Bushel. 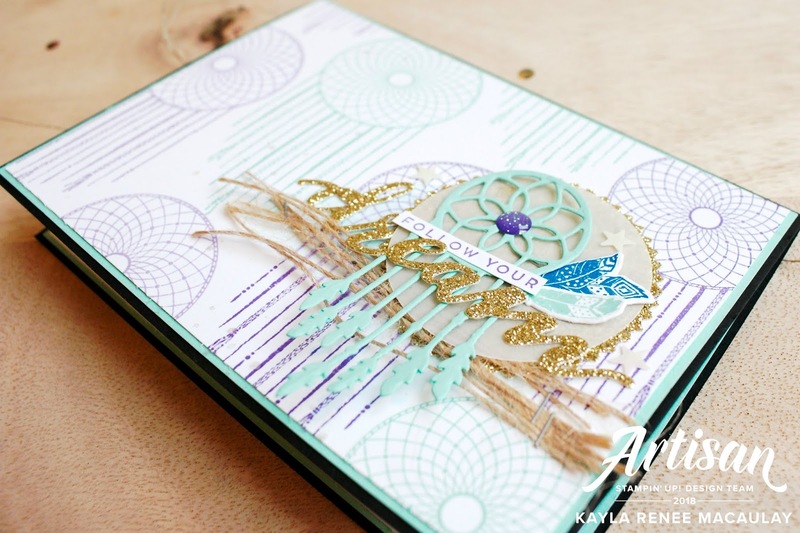 Here's a look at the full card which I have repetitively stamped the dream catcher on the background in both Coastal Cabana and Gorgeous Grape. I also spritzed the background with Wink of Stella for a bit of added sparkle and shine. I combined it with some Gold Glimmer which I die cut from the coordinating dies that go with the suite and stamped one of the sentiments from the stamp set and just used the 'follow your' part of the sentiment. I added a couple of feathers stamped in Coastal Cabana and Blueberry Bushel which I die cut. I added some Twinkle Twinkle Adhesive backed sequins from the A Little Twinkle suite of products as they match perfectly with this bundle. I also added some Glitter Enamel Dots. My favourite addition to the card was the Burlap Ribbon which I actually tore apart into individual threads and stapled to the card. I hope you enjoyed my little bit of a card share today, it was just a quick one but I can't wait to do more with this bundle. P.S. If you like my card and love it enough to vote for it, here's a link back to my lovely manager's blog if you would like to vote for it.